I finally finished my first jacket! I’ve been working on this forever, about 16 months, which is way, way too long. 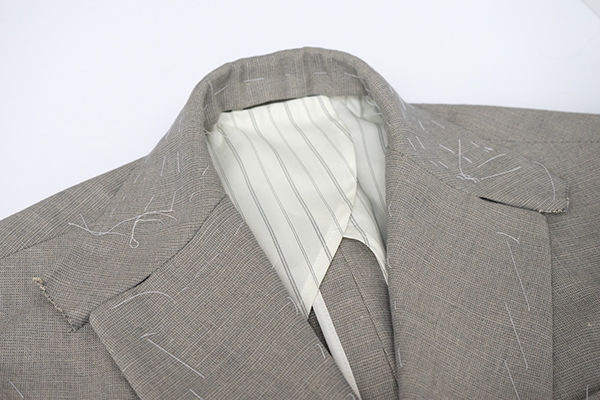 It is a two button, unstructured, side vent jacket with a minimal lining. I made it out of a piece of textured cotton I’ve had laying around in my stash for a while. The fit isn’t perfect, but as usual, these things are a work in progress. I wanted a classic look, not too tight, not too loose, not too short. I also wanted a fairly wide lapel when I started out. 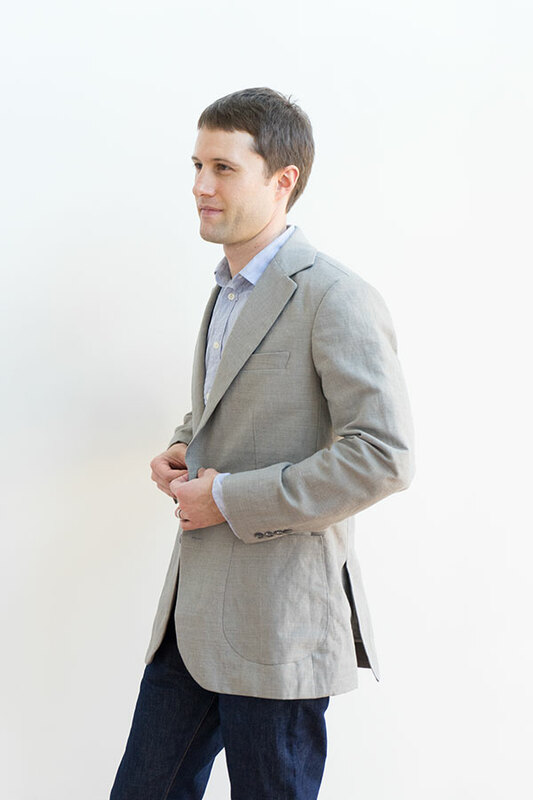 Having said that, I would probably shorten the length just a little next time, and narrow the lapel a bit. I’m still not a fan of really narrow lapels, but I would probably shave a 1/4” or so off of this one for the next jacket. For the pattern, I used a draft I found on the Cutter and Tailor forum to start, then made adjustments to the fit from there. 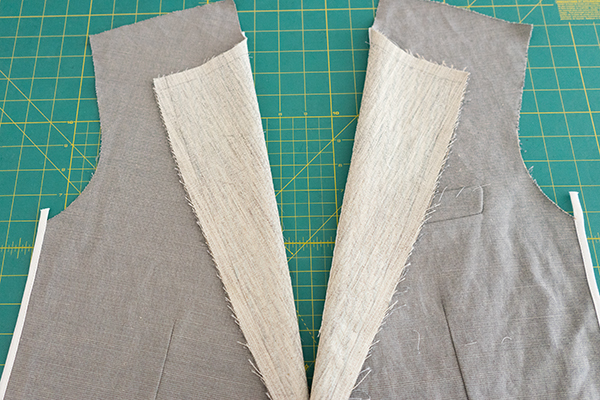 Even though it’s just cotton and not a nice wool, I wanted to practice pad stitching for the lapels. I also pad stitched the collar using felt, and assembled the collar by hand. As far as construction techniques go, I used a Roberto Cabrera and Patricia Flaherty Meyers book called Classic Tailoring Techniques: A Construction Guide for Menswear. My hand stitching could use some more practice. I really loved this method for attaching and building the collar. 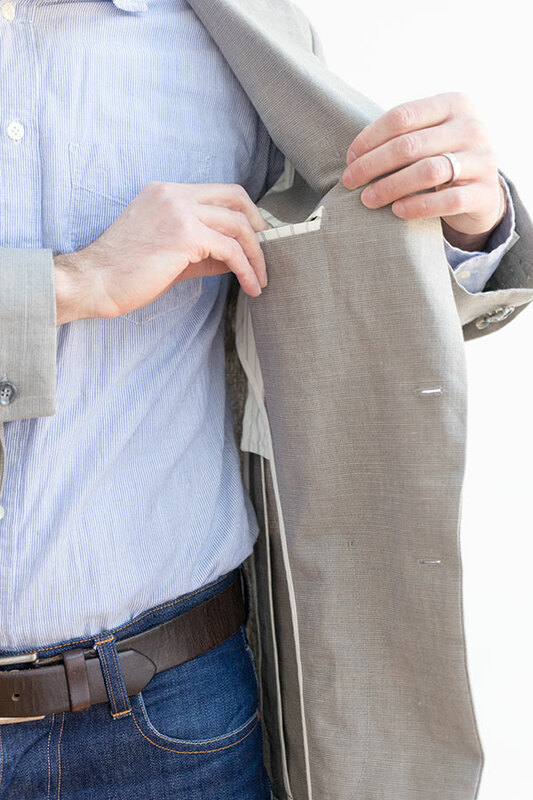 Rather than using a piece of the jacket fabric as an under collar, attaching it right sides together and then turning the collar right side out, like you might do with a shirt, this was much more satisfying. 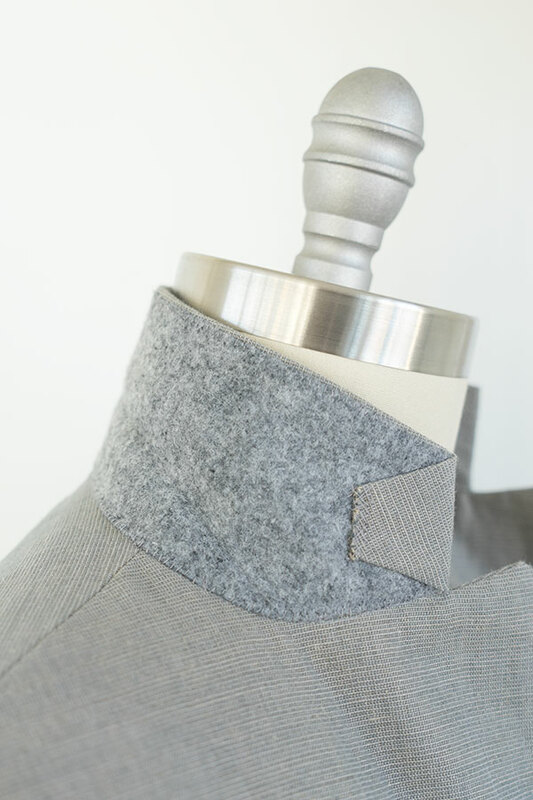 The felt goes directly on the outside of the collar line to the right side of the jacket fabric, and then the top collar ends are folded over like a tailored suit jacket or sport coat. This made for a much cleaner look. There are two double welt pockets on the inside facing and hip patch pockets on the outside. The cuffs are functional surgeon’s cuffs, you know, in case I ever have to roll up my sleeves and get dirty and don’t have time to take my jacket off 🙂 . 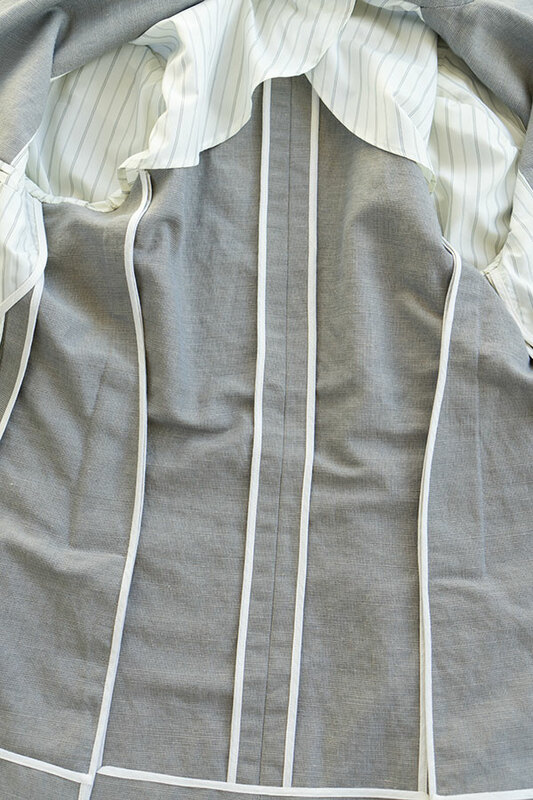 I lined the sleeves, and put in a couple pieces of “floating” lining fabric over the shoulder area to be able to easily slide the jacket on and off, otherwise it is unlined. Then I used bias tape throughout to finish all of the other seams. The weather in Nashville can be quite warm in the spring, fall, and summer, so I wanted something as light weight as possible (without using expensive linen for a first jacket). This meant that I didn’t want a full lining, and except for the lapels and collar, I left out most of the traditional structure you might find in a jacket. There is a time and a place for a structured jacket that is fully canvased with shoulder pads and lots of shape, but I rarely find myself in that sort of time or place. 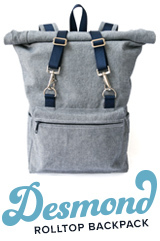 I actually really like the unstructured look. The less structure, the less formal and more natural the look in my opinion. I’m hoping for more sewing in 2017 than I was able to do in 2016. I’ve already started work on a new trouser pattern, have plans for a different type of jacket, updated shirt pattern, and perhaps another bag pattern release! I love your jacket – I would like it for myself! The way you describe why you picked this style, materials and construction would exactly be my reasoning which made me laugh because it was the picture of your jacket in the first place that attracted me to reading your blog. I too don’t like jackets that are too warm, formal or structured. I love your hong kong seams especially. I keep thinking I’m going to that on a jacket and then stop because I get too impatient to get it done! Beautiful job – love the collar too – so neat. Thanks John! The pattern weights are just large washers from a hardware store. I think you should be able to find something similar in the Netherlands. Wow! I’m so very impressed with your first venture into a tailored garment. It’s just beautiful and you are a handsome boy in it. Thank you for doing the post on it, however long it took you to complete it when it comes to us we eat it up! I’m going back to read it again, well done Sweetie! Beautifully made! (Like all your projects). I’m sure you’ll get lots of use out of this jacket. Thank you so much! I’ve always admired your projects, and was inspired by some of the jackets you’ve made in the past. By the way, I’ve tried commenting on your blog on several occasions, but don’t seem to have the right “login credential” option for leaving a comment. I’m a long time reader though, and love the fur backpack you recently made! Good to see you back. Looking forward to what you come up with in 2017. Taylor, I love your jacket. For your first jacket you did an excellent job. The cotton fabric and the color is very nice. I will be checking back and visiting your blog in the near future to see future projects. Your readers have waited a long time for this one… and it was worth it! Great job, beautiful fit, and thank you for doing everything so carefully and with such intelligence. I’m inspired. 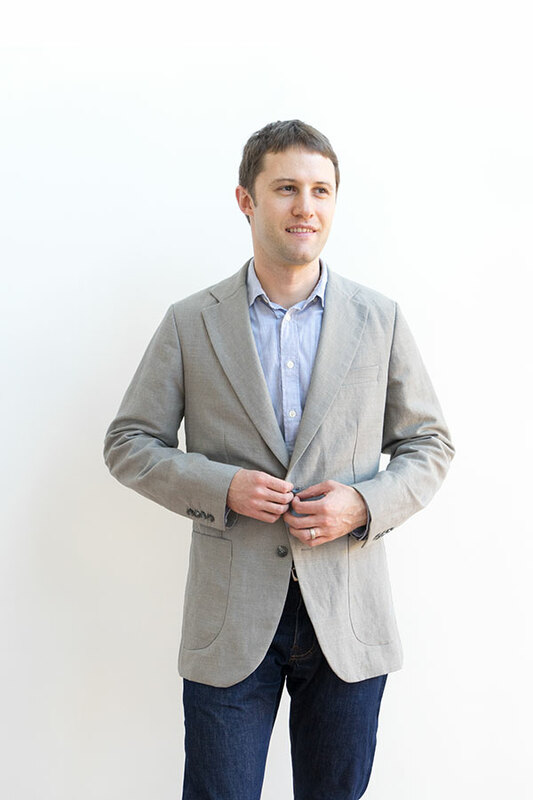 Congratulations on your first tailored jacket! What a wonderful array of skills you have developed and the finished result is very sharp 😀 I have never seen a jacket collar constructed using that method before – such a lovely finish! Wow! That’s a sharp jacket. Consider me jealous. Nice work. I’ve been making vests and jackets lately from recycled jeans that I pick up at yard sales. Two pair of jeans makes a vest and three or four makes a jacket. I like the vests because their fast to make and can be worn daily this winter. I continue to be amazed by what you produce and am busily scribbling down resources to add to my list! This is exactly the type of jacket my 13 year old has been after for a few years so maybe its time I sat down and work on something! Is the Cabrera and Meyers book a resource worth having for this kind of work (for the beginner)? Thank you! I have the older version of the book (I think there is an updated version). I bought the book as a beginner, and didn’t quite understand some of the techniques and diagrams. Once I had a little more experience, the book made more sense. 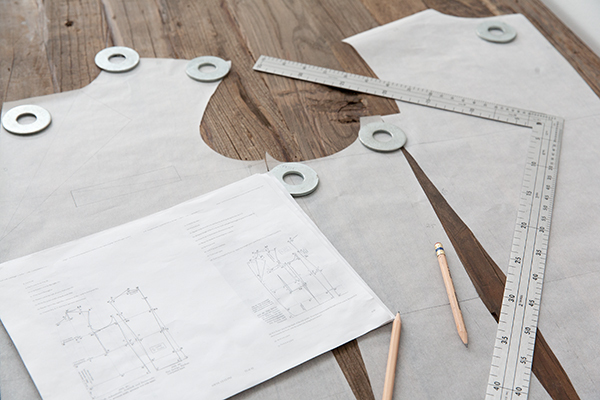 There are still some confusing areas, as the book isn’t quite a perfect step by step solution, but it is one of the few resources for constructing this type of garment. Worth buying in my opinion. Hi Taylor! I recently discovered your page and just wanted to drop a quick note to say well done and that I hope we get to see more work from you soon! Great job on this jacket – it looks sharp yet casual and I’m really hoping that I can make something similar for my husband one day. 😉 Keep up the beautiful work! Thanks Katie! Good luck with your sewing adventures! I agree with you thats a little bit too long. I am tailoring student too and my first jacket project is not good as yours. Hands down on this pattern Taylor.. I have been sewing ladies clothes and never tried my hands on boys clothing. But today i am getting an urge to try my hands on boys clothing. and this post is the perfect place for me to start. Thanks so much again. I will subscribe to your blog for more posts like this. Hi Taylor. I just found your website. This is impressive! If I could only do that with women’s clothes. Your patience is inspiring and I will follow your site. Nice work. It’s some ten years since I last visited your blog and it’s nice to see you’re still as enthusiastic.